We’d love your help. 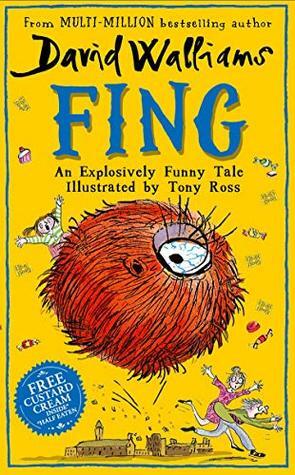 Let us know what’s wrong with this preview of Fing by David Walliams. Myrtle Meek has everything she could possibly want. But everything isn’t enough. She wants more, more, MORE! When Myrtle declares she wants a FING, there’s only on The new children’s book from No. 1 bestselling author David Walliams – a deliciously daft Tall Story of a child who had everything, but still wanted more. Illustrated by artistic genius, Tony Ross. To ask other readers questions about Fing, please sign up. Does the writer want people to rethink the parenting style? Elongated 'World's Worst Child' tale, not a strong Walliams story. From the first, I had the feeling this was one of the WWC series, expanded. This was the first time my son has bought a Walliams' on day of publication, as he's such a fan of every other by the author (we've only missed out Awful Auntie). It's taken around 10 nights for me to read it to him, and he's enjoyed it. So this review is not from his perspective - an 8 year old will love this: bum/poo jokes, lots of noises and silly creatu Elongated 'World's Worst Child' tale, not a strong Walliams story. So this review is not from his perspective - an 8 year old will love this: bum/poo jokes, lots of noises and silly creatures, things being destroyed, lists. It's also half the length of most of Walliams' recent novels, but still with regular Tony Ross sketches, so does speed along. No, it's great for the target market. But as an experienced reader and librarian, it's pretty weak I'm afraid. This is the author's first novel with no hero/heroine. As Myrtle is a World's Worst Child in all but book title, she's actually also a minor character for most of the book. Spoiled by her librarian parents (oh what a terrible example they set for my profession! ), she's a stereotype of an indulged brat with no personality anyway - nobody will be dressing up as her next World Book Day. And Mr and Mrs Meek themselves are spineless simpering cliches, calling each other 'Mother' and 'Father'. There's nothing to them and they don't grow or do anything of note throughout the entire book. The story itself is ridiculously simple: brat wants 'Fing' as pet. Parents acquiesce. Parents find said potentially destructive pet. (SPOILER!!) Destruction occurs. A World's Worst Children-like 'serves-you-right ending for spoilt brat' also occurs. While my son found this entertaining, and I did enjoy some moments (list of unusual creatures in the MONSTERPEDIA being one), it just didn't feel as though it had been created with much love or care as some of the author's others clearly were. Even Fing himself has no character - he's an eating/pooing being, no emotion besides a lot of 'grrrr'ing. So I didn't care for the girl, her parents, the pet - there's no 'enemy' or battle... it really is just a reject from World's Worst Children or one made longer. We spotted our beloved Raj twice (once as a graphic on a bus, and once Walliams shoehorns him in, even saying he's done it to place the beloved newsagent in the story). Always a highlight, but certainly not enough to help raise this up from 'meh' rating to the bestselling status it will instantly earn without the merit of Walliams' previous heartfelt and genuinely funny inventions. Katy Noyes Michelle, that made my day! And please DO look into other Walliams. I’d recommend starting with his first: The Boy in the Dress, it’s full of genuine Michelle, that made my day! And please DO look into other Walliams. I’d recommend starting with his first: The Boy in the Dress, it’s full of genuine heart - then Billionaire Boy, Gangsta Granny, and The Midnight Gang. Enjoyed reading this my son. It is very Roald Dahl-esque and was enjoyable, however, it could have been significantly shorter and it felt that he was trying too hard by the end. The constant asterisks throughout the story were also off-putting for me as a reader and for my son as a listener. I did like the onomatopoeia throughout and it allowed my son to get involved with the reading as well. Overall it is a fun read for parents and kids. Fantastic Illustrations by Tony Ross. I am an avid reader of David Walliams books. Adventure starts with the parents quest to find Fing for their demanding kid and how it leads them on a terrifying and troublesome journey. I love the peaceful and happy ending. The author takes the readers with his amazing creativity to a different level of imagination. In this book, I loved the part wher Fantastic Illustrations by Tony Ross. Perfectly daft and made me smile. Working in a primary school, I know I will be sharing this book. This is David's latest book. and its completely mental. If your familiar with David's World Worst Children and love them. you will adore this. It is based only on one child Myrtle Meek and she is a nightmare child. who's life gets changed for ever after she demands, that she wants a Fing . Her parents both librarians, have no idea what Fing is so they go to the library and look it up in books. They find it and go on adventure to Collect the monster. This book is classic Davi I loved this book!! I read this to my daughter every night for the past week. Extremely funny story! We couldn’t wait to read it every night. this book was amazing. David walliams writing techniques really stood out in this particular book. Got this book on the day it came out, started it that evening and finished it by the next morning. What a lovely, funny story about Fing and Myrtle And Myrtles parents. Highly recommend if you liked Walliam’s other novels or Roald Dahl. Mr and Mrs Meek will do anything to keep their darling daughter happy, even visit the library vaults to delve into the dusty pages of the mysterious Monsterpedia. Their desperate quest leads to the depths of the jungliest jungle where the rarest of creatures can be found. But will they ever fin Meet the Meeks! But will they ever find a FING...? Another fantastically hilarious tale from David Walliams, with excellent characters and a brilliant story line. Highly recommended. Meet Mr. and Mrs. Meek, who are, as their name implies, meek. They have a daughter, Myrtle, who they have never denied anything. From the time Myrtle was an infant, she would raise the roof if she did not get what she wanted. Her parents, being meek and wanting to calm things over, always gave in. Now, Myrtle has become a holy terror and when she announces she wants a fing, her parents are desperate to discover first what it is and then how to procure one. The ending is not quite what one would Meet Mr. and Mrs. Meek, who are, as their name implies, meek. They have a daughter, Myrtle, who they have never denied anything. From the time Myrtle was an infant, she would raise the roof if she did not get what she wanted. Her parents, being meek and wanting to calm things over, always gave in. Now, Myrtle has become a holy terror and when she announces she wants a fing, her parents are desperate to discover first what it is and then how to procure one. The ending is not quite what one would expect. I read this book to my two boys over a few weeks. My eldest (8) quite enjoyed it. My youngest (6) found it scary in parts. Both commented how naughty and rude Myrtle was. As the reader I find Walliams use of foot notes irritating and it spoils the flow of reading, as when I spot the note at the bottom of the page I end up trying to scan the page to find the asterix, whilst trying to concentrate out what I’m reading to my sons. Shorter than most of David's stories but still enjoyed it. Found Myrtle incredibly annoying and her parents more so for putting up with it. Younger readers will enjoy this book. Ridiculous and silly, I skim read a lot of it. Found the parents pandering to the awful child really frustrating. But I am not the age group this book is aimed at. (Loved the Boy in the Dress and Grandpa's Great Escape). I was lucky enough to read this in one sitting. Not as good or as long as The Ice Monster. Maybe I'm reading this from a parent point of view but what a spoilt child. Too much and off putting but I stuck with it. Great drawings by Tony Ross which make the book but characters needed more development, they were awful and irritating. I wanted to like the poor suffering parents but they were awful too. This was a stretched out world’s worst children story about Myrtle stretched out. You have to love a Williams! Silly and far fetched but that’s what makes it fun! Excellent 2nd grade class read aloud. It had my students laughing out loud and begging for more. Read with Ophelia. We both agreed it was mildly interesting but quite lazy in lots of respects; the plot was simple and the jokes weren't that funny.